Place your pie orders by selecting a variety, quantity & delivery location below. Click the "Add to Cart" button and you will be redirected to Paypal to make your payment. 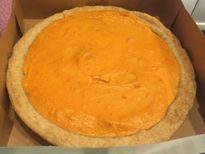 Remember, we also accept orders for donated pies to be delivered to local families in need - just select that option from the "Pick Up Location" menu and we'll do the rest! HINT: If you want to order a different quantity of pies than is listed below, you can add the first item to your cart, then select the "Continue Shopping" button in Paypal to close that window - don't worry...when you click "Add to Cart" for your extra items, they will be added on to your original order. to download a pie order form!